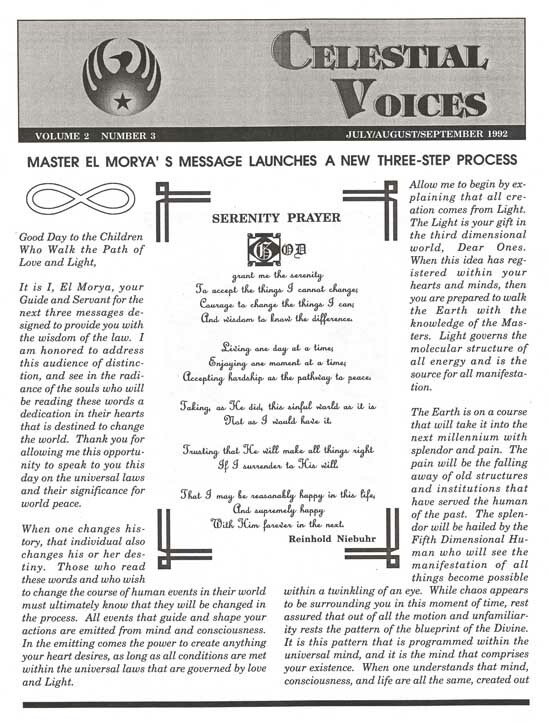 Celestial Voices is a quarterly newsletter containing messages sent from the Ascended Masters. The wisdom contained in these newsletters is timeless and priceless. The instruction details such things as the Six-Steps to enter the Fifth Dimension (six issues), How to Manifest Abundance (three issues), the Twelve Levels of Initiation (eight issues), the Seven Tests of Empowerment (seven issues) and the Laws of the Higher Dimensions. The Ascended Masters continually transmit profound information in these newsletters that contain practical ideas for changing our lives. All back issues (Celestial Voices started in January of 1991) can be ordered or they can be individually downloaded as an Adobe PDF file. Please call us at 480-767-5346 for shipping and handling rates or ordering information.